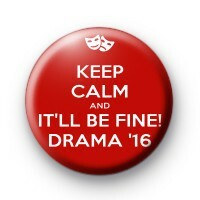 A customer red and white button badge in the keep calm style reading keep calm and it'll be fine drama 2016. These custom drama badges are for Emily Gammie to give out to her drama students. Badge designed & hand made in our UK workshop. The overseas delivery is actually decent. Better than decent. Also I got 2 extra badges.. Thanks Vicki..
Order arrived yesterday afternoon - very pleased with them. Speedy delivery and great quality. Thank you.